Vapor barriers are most important in cold climates, where the difference in humidity between cold dry outdoor air and warm moist indoor air forces moisture through the walls and ceiling. The vapor barrier in cold climates should face the indoors. If an impermeable material like polyethylene, installed as a vapor barrier, is attached in an airtight manner to framing lumber, the result is an air/vapor barrier. Vapor-barrier paints are often the only practical way to achieve a vapor barrier in an existing home. In warm climates, with both air conditioning and heating, moisture is coming from outside to inside during the summer and from inside to outside during the winter. It may be best not to install vapor barriers and instead design the cavities be porous to drying from either side of the wall in these warm climates. The ground under a crawl space or basement can be the major source of water vapor from air migration through the ground and also evaporation from damp ground. Ground moisture barriers stop water vapor rising through the ground and into the home, and also prevent evaporation from damp ground. Ground-moisture barriers should be installed over dirt floors of crawl spaces and under concrete slabs. Reinforced polyethylene plastic makes a good ground moisture barrier. If the seams of the barrier are sealed with a durable tape and /or sealant, this ground covering can also be an air barrier. 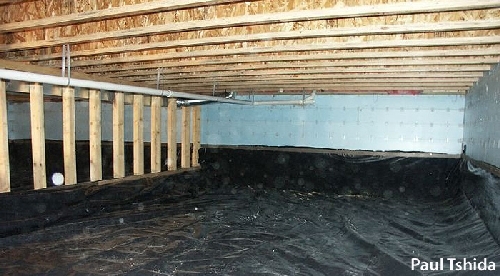 Ground-moisture barriers are not effective in crawl spaces with standing water, unless the crawl space is designed to drain water off the top of the ground moisture barrier into a sump hole, equipped with a sump pump. Residential Energy: Cost Savings and Comfort for Existing Buildings, Saturn Energy Auditor Field Guide, andYour Mobile Home: Energy and Repair Guide for Manufactured Housingcontain more information about solving moisture problems.